Is that a lory? I've always wanted one, but have heard such horror stories about how messy they are and how you'll spend your every free minute cleaning up their poop! 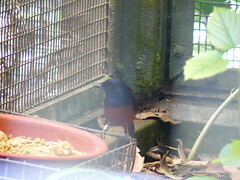 The photos were of my white rump shama Yingshiong. I wrote that report(seen after this) late in the evening. I tried to attach photos taken by my wife to that report. But due to quirks of time zones with us in Taiwan and Flickr in USA, those photos got placed at earlier times and posted before the report made.